Many roofs will develop stains, black algae, and even moss, and once these things begin to accumulate, the entire home will look hideous. These materials can do serious damage to your roof. When this happens, the expected life duration of the roof will be drastically reduced. Fortunately, there are several ways to clean a roof, but you have to be aware of all of your options and all of the things that you should avoid. Before you can begin to clean your roof, it is important to know what causes these different elements to grow onto the roof. Contrary to what many people may think, if these materials have food, water, and air, they will not have any problems growing. If the roof is made from asphalt, these materials will eat the limestone filler. If the roof is made from wood, these materials can simply survive by eating the wood itself. Occasionally, one area of the roof may have problems, but the other side will be clean. This happens because the areas that are in shaded areas will have the tendency to retain moisture longer; furthermore, these shaded areas will not have ample sunshine to prevent growth of these materials. The first option that you have to clean the roof is to simply replace it. Although this a quick fix, it is a very expensive fix. 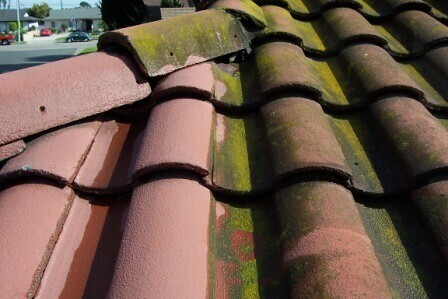 Also, once the new roof is placed on the home, it can also be susceptible to algae and moss after a certain time period. Usually, this time period is for ten years. Unfortunately, most algae growth cannot be seen until after ten years; therefore, by the time the algae growth begins to appear, all warranties with the roof will be expired. A second option to consider is to hire the services of a roof cleaning company. By investing in a roof cleaning company, you will be comfortable in knowing that the workers can safely and effectively remove all algae or moss growth. Before hiring the company, it is important to get a list of references that have used the particular’s company services. Also, you should be sure that the company has specialized insurance coverage. A final option will be to clean the roof yourself. If you have the right skills and patience, you can easily clean your roof in one day. However, you must be sure to choose the right cleaning supplies. There are several roof cleaning products on the market today, but many of these products are very misleading. There are no roof cleaning products that will effectively work by simply spraying them onto your roof. 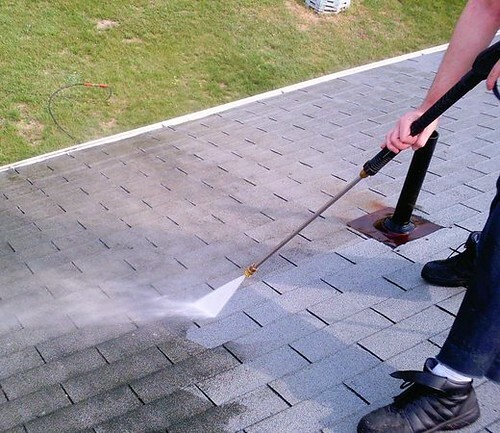 In order to clean the roof, you will have to apply your cleaning material, scrub the area, and spray the area. These steps may have to be completed several times before the roof is actually clean. After the roof is totally clean, it is best to apply zinc near the roof’s ridge. Zinc will prohibit the algae, moss, and other materials from growing. This has been a guest post from the Brisbane Roofing Directory, a website that helps you locate a good roofer locally.